John Carroll O'Connor (August 2, 1924 – June 21, 2001) was an American actor, producer, and director whose television career spanned four decades. A lifelong member of the Actors Studio, O'Connor first attracted attention as Major General Colt in the 1970 film Kelly's Heroes. The following year, he found fame as bigoted working man Archie Bunker, the main character in the 1970s CBS television sitcoms All in the Family (1971-79) and its spinoff, Archie Bunker's Place (1979-83). O'Connor later starred in the NBC/CBS television crime drama In the Heat of the Night (1988-95), where he played the role of Sparta, Mississippi police chief William (Bill) Gillespie. At the end of his career in the late 1990s, he played the father of Jamie Buchman (Helen Hunt) on Mad About You. Carroll O'Connor, an Irish American, was the eldest of three sons. He was born on August 2, 1924, in Manhattan, New York City, to Edward Joseph O'Connor, a lawyer, and his wife, Elise Patricia O'Connor. Both of his brothers became doctors: Hugh, who died in a motorcycle accident in 1961, and Robert, a psychiatrist in New York City. O'Connor spent much of his youth in Elmhurst and Forest Hills, Queens, the same borough in which his character Archie Bunker would later live. In 1941, O'Connor enrolled at Wake Forest University in North Carolina, but dropped out when the United States entered World War II. During the war, he was rejected by the United States Navy and enrolled in the United States Merchant Marine Academy for a short time. After leaving that institution, he became a merchant seaman and served in the United States Merchant Marine during World War II. After the war, O'Connor attended the University of Montana-Missoula, where he met Nancy Fields, who later became his wife. He also worked at the Montana Kaimin student newspaper as an editor. At the University of Montana, he joined the Sigma Phi Epsilon fraternity. O'Connor did not take any drama courses as an undergraduate at the University of Montana. He later left that university to help his younger brother Hugh get into medical school in Ireland, where Carroll completed his studies at the University College Dublin and began his acting career. After O'Connor's fiancée, Nancy Fields, graduated from the University of Montana in 1951 with degrees in drama and English, she sailed to Ireland to meet Carroll, who was visiting his brother, Hugh. The couple married in Dublin on July 28, 1951. In 1956, O'Connor returned to Missoula to earn a master's degree in speech. O'Connor made his television acting debut as a character actor on two episodes of Sunday Showcase. These two parts led to other roles on such television series as The Americans, The Eleventh Hour, Gunsmoke, Bonanza, The Fugitive, The Wild Wild West, Armstrong Circle Theatre, The Outer Limits, The Great Adventure, The Man from U.N.C.L.E., Dr. Kildare, I Spy, That Girl, Premiere and Voyage to the Bottom of the Sea, among many others. O'Connor starred as an Eastern European villain in the first season of Mission Impossible, season one, episode 18 "The Trial". Late in his career, he appeared on several episodes of Mad About You as the father of Helen Hunt's character. O'Connor was cast in the 1963 episode of Death Valley Days, "A Gun Is Not a Gentleman", as U.S. Senator David C. Broderick, a California Democrat. In the story line, Broderick, who has never used a gun, is challenged to a duel by former political ally, former California Supreme Court justice David S. Terry (Brad Dexter). Broderick was an abolitionist; Terry, pro-slavery. After he fatally shoots Broderick, Terry was tried, but the case was dismissed. He was among the actors considered for the roles of the Skipper on Gilligan's Island and Dr. Smith in the TV show Lost in Space, and was the visual template in the creation of Batman foe Rupert Thorne, a character who debuted at the height of All in the Family's success in Detective Comics No. 469 (published May 1976 by DC Comics). In 1963, O'Connor was cast as U.S. Senator David C. Broderick of California, with Brad Dexter as Justice David S. Terry in "A Gun Is Not a Gentleman" on the syndicated anthology series, Death Valley Days, hosted by Stanley Andrews. Terry mortally wounded Senator Broderick in 1859. Though past allies as Democrats, Terry, a defender of slavery, challenged the anti-slavery Broderick to a duel. O'Connor was living in Italy in 1968 when producer Norman Lear first asked him to come to New York to star in a pilot he was creating for ABC called Justice For All, with O'Connor playing Archie Justice, a lovable yet controversial bigot. After three pilots done between 1968 and 1970, a network change to CBS, and the last name of the character changed to Bunker, the new sitcom was renamed All in the Family. The show was based on the BBC's Till Death Us Do Part, with Bunker based on Alf Garnett, albeit somewhat less abrasive than the original. O'Connor's Queens background and New York accent is said to have influenced Lear to set the show in Queens. Wanting a well-known actor to play the role, Lear had approached Jackie Gleason and Mickey Rooney to play Archie; both declined. O'Connor accepted, not expecting the show to be a success and believing he would be able to move back to Europe. In her book Archie & Edith, Mike & Gloria: the Tumultuous History of All in the Family, Donna McCrohan noted that O'Connor requested that Lear provide him with a return airplane ticket to Rome as a condition of his accepting the role, so he could return to Italy when the show failed. Instead, the show became the highest-rated television show on American television for five consecutive seasons until the 1976–77 season (the sixth season). O'Connor's own politics were liberal. He understood the Bunker character and played him not only with bombast and humor, but also with touches of vulnerability. The writing on the show was consistently left of center, but O'Connor often deftly skewered the liberal pieties of the day. Although Bunker was famous for his malapropisms of the English language, O'Connor was highly educated and cultured and was an English teacher before he turned to acting. The show also starred a Broadway actress, also from New York City, Jean Stapleton, in the role of Bunker's long-suffering wife, Edith Bunker, whom Lear remembered from seeing in the play and film Damn Yankees. The producer sent the show over to ABC twice, but it did not get picked up. They then approached CBS with more success, and accordingly, All in the Family was retooled and debuted early in 1971. The show also starred unknown character actors, such as Rob Reiner as Archie's liberal son-in-law, Michael "Meathead" Stivic, and Sally Struthers as Archie and Edith's only child and Mike's wife, Gloria. The cast had a unique on- and off-camera chemistry, especially Reiner, who became O'Connor's best friend and favorite actor. CBS was unsure whether the controversial subject matter of All in the Family would fit well into a sitcom. Racial issues, ethnicities, religions, class, education, women's equality, gun control, politics, inflation, the Vietnam war, energy crisis, Watergate and other timely topics of the 1970s were addressed. Like its British predecessor Till Death Us Do Part, the show lent dramatic social substance to the traditional sitcom format. Archie Bunker's popularity made O'Connor a top-billing star of the 1970s. O'Connor was afraid of being typecast for playing the role, but at the same time, he was protective of not just his character, but of the entire show, too. A contract dispute between O'Connor and Lear marred the beginning of the show's fifth season. Eventually, O'Connor got a raise and appeared in the series until it ended. For his work as Archie Bunker, he was nominated for eight Emmy Awards as Outstanding Lead Actor in a Comedy Series; he won the award four times (1972, 1977, 1978 and 1979). When All in the Family ended after nine seasons, Archie Bunker's Place continued in its place and ran for four additional years. Longtime friend and original series star Jean Stapleton kept her role as Edith Bunker, but was limited to about a half dozen guest appearances in season one. In the second-season premiere, her character died of a stroke, leaving Archie to cope with the loss. The show was cancelled in 1983. O'Connor was angered about the show's cancellation, maintaining that the show ended with an inappropriate finale. He vowed never to work in any type of show with CBS again, although he starred in In the Heat of the Night, which aired on CBS in that show's last three seasons. While coping with his son's drug problem, O'Connor starred as Sparta, Mississippi, Police Chief Bill Gillespie, a tough veteran cop on In the Heat of the Night. Based on the 1967 movie of the same name, the series debuted on NBC in March 1988 and performed well. He cast his son Hugh O'Connor as Officer Lonnie Jamison. The headquarters of the Sparta Police Department was actually the library in Covington, Georgia. In 1989, while working on the set, O'Connor was hospitalized and underwent open heart surgery, which caused him to miss four episodes at the end of the second season (actor Joe Don Baker took his place in those episodes as an acting police chief.) O'Connor would later serve as one of the executive producers for the series, starting with the third season. The series was transferred from NBC to CBS in 1992 and cancelled two years later after its seventh season. O'Connor reprised his role the following year for four two-hour In the Heat of the Night television films to critical acclaim. While on the series, O'Connor recorded "Bring a Torch, Jeanette Isabella" for the 1991 In the Heat of the Night Christmas CD Christmas Time's A Comin'. He was joined by Grand Ole Opry star mandolinist Jesse McReynolds, Nashville accordionist Abe Manuel, Jr., and Nashville fiddlers Buddy Spicher and Randall Franks. CD Producer and series co-star Randall Franks created the arrangement which was co-produced by series co-star Alan Autry. He joined other members of the cast for a recording of "Jingle Bells" with vocals by Country Music Hall of Fame members Little Jimmy Dickens, Kitty Wells, Pee Wee King, the Marksmen Quartet, Bobby Wright, Johnnie Wright and Ken Holloway. In 1973, his fraternity conferred its highest honor, the Sigma Phi Epsilon Citation, on him. In July 1991, O'Connor, Jean Stapleton, Reiner, and Sally Struthers were reunited to celebrate the 20th anniversary of All in the Family. Due to reruns which aired in syndication, TV Land, Antenna TV, and CBS, the show's popularity continued. In March 2000, he received a star on the Hollywood Walk of Fame and was given a St. Patrick's Day tribute by MGM. In 1962, while he was in Rome filming Cleopatra, O'Connor and his wife adopted a six-day-old boy, naming him Hugh after O'Connor's brother who had died a year earlier. At age 17, Hugh worked as a courier on the set of Archie Bunker's Place. O'Connor eventually created the role of Officer Lonnie Jamison on In the Heat of the Night for his son. On March 28, 1995, O'Connor's son Hugh died by suicide after a long battle with drug addiction. Following his son's death, O'Connor appeared in public service announcements for Partnership for a Drug Free America and spent the rest of his life working to raise awareness about drug addiction. O'Connor also successfully lobbied to get the state of California to pass legislation allowing family members of an addicted person or anyone injured by a drug dealer's actions, including employers, to sue for reimbursement for medical treatment and rehabilitation costs and other economic and noneconomic damages. The law, known as the Drug Dealer Civil Liability Act in California, went into effect in 1997. It is also referred to as the Hugh O'Connor Memorial Law. The act is based on the Model Drug Dealer Liability Act authored in 1992 by then Hawaii U.S. Attorney Daniel Bent. The Model Drug Dealer Liability Act has been passed in 17 states and the Virgin Islands. A website devoted to the Act can be found at: www.ModelDDLA.com. Cases have been brought under the Act in California, Illinois, Utah, and other states. His son's suicide inspired O'Connor to start a crusade against the man who sold the drugs to Hugh. He called Harry Perzigian "a partner in murder" and a "sleazeball". Perzigian filed a defamation lawsuit against the actor. In 1997, a California jury decided in O'Connor's favor. In an interview on CNN's Larry King Live soon after the verdict, O'Connor said he would never be able to put his son's death behind him. "I can't forget it. There isn't a day that I don't think of him and want him back and miss him, and I'll feel that way until I'm not here any more," he said. In 1997, the O'Connors donated US$1 million (worth $1,560,738 today) to their alma mater to help match a challenge grant to the University of Montana from the National Endowment for the Humanities. The university named a regional studies and public policy institute the O'Connor Center for the Rocky Mountain West. Afterward, O'Connor taught screenwriting at the university. In 1998, O'Connor underwent a second surgery to clear the blockage in a carotid artery, to reduce his risk of stroke. O'Connor died on June 21, 2001, in Culver City, California, from a heart attack due to complications from diabetes at age 76. His funeral Mass was celebrated at St. Paul the Apostle Catholic Church in Westwood, Los Angeles, California, and was attended by All in the Family cast members Rob Reiner, Sally Struthers, and Danielle Brisebois, as well as producer Norman Lear. Jean Stapleton, who had been a close friend of O'Connor's since the early 1960s, did not attend the service due to a commitment for a stage performance. O'Connor's best friend Larry Hagman and his family were also there, alongside the surviving cast of In the Heat of the Night, including Alan Autry and Denise Nicholas, who also attended the Mass. Actor Martin Sheen, then starring on The West Wing, delivered the eulogy. O'Connor's body was buried at Westwood Village Memorial Park Cemetery with his son Hugh's cenotaph placed on his grave stone. In honor of O'Connor's career, TV Land moved an entire weekend of programming to the next week and showed a continuous marathon of All in the Family. 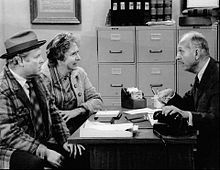 During the commercial breaks, TV Land also showed interview footage of O'Connor and various All in the Family actors, producers with whom he had worked, and other associates. His wife, Nancy Fields O'Connor, died November 10, 2014, at age 84. ^ Garfield, David (1980). "Appendix: Life Members of The Actors Studio as of January 1980". A Player's Place: The Story of The Actors Studio. New York: MacMillan Publishing. p. 279. ISBN 978-0025426504. (Subscription required (help)). ^ a b c d e f g h i j k "Carroll O'Connor Biography (1924–2001)". FilmReference.com. Retrieved September 3, 2011. ^ Severo, Richard. "Carroll O'Connor, Embodiment of Social Tumult as Archie Bunker, Dies at 76", The New York Times, June 22, 2001. Accessed November 18, 2007. "The O'Connors lived well, at first in the Bronx, later in a larger apartment in Elmhurst, Queens, and finally in a nice single-family home in Forest Hills, Queens, then an enclave for people of means." ^ Shattuck, Kathryn. "Carroll O'Connor". The New York Times. Retrieved 2009-03-19. ^ a b "Sigma Phi Epsilon – Prominent Alumni". Sigma Phi Epsilon Fraternity. Archived from the original on February 28, 2009. Retrieved March 21, 2010. ^ a b c "All in the UM Family – O'Connors Donate $1 Million to Center". University of Montana. Archived from the original on July 2, 2011. Retrieved August 7, 2011. ^ O'Connor, Carroll (April 1, 1999). I Think I'm Outta Here. Simon & Schuster. pp. 140–143. ISBN 978-0671017606. ^ "A Gun Is Not a Gentleman" on Death Valley Days". Internet Movie Database. Retrieved February 28, 2019. ^ "Carroll O'Connor". New York Times. Retrieved September 2, 2011. ^ Slewinski, Christy (March 25, 1994). "It's No Big Deal". Chicago Tribune. Retrieved 23 February 2019. ^ Minow, Neil (July 20, 2014). "Rob Reiner on the Middle-Age Love Story 'And So It Goes'". HuffPost. ^ "Carroll O'Connor has gall bladder removed". UPI. March 20, 1989. Retrieved January 2, 2018. ^ "Carroll O'Connor's Son Kills Himself at 33". The New York Times. March 30, 1995. ISSN 0362-4331. Retrieved January 2, 2018. ^ O'Neill, Ann W.; Mozingo, Joe (July 26, 1997). "O'Connor Cleared of Defamation". Los Angeles Times. Retrieved 2018-08-30. ^ Huffman, John Pearlly (August 2, 1997). "10 Questions With...Carroll O'Connor". Motor Trend. Retrieved 2018-08-30. ^ Andreeva, Nellie (June 27, 2001). "H'wood Family Turns Out To Remember O'connor". The Hollywood Reporter. Archived from the original on February 19, 2008. ^ Briggeman, Kim (November 13, 2014). "Missoula's Mrs. Archie Bunker - Nancy O'Connor - dies at 84 in Malibu". Missoulian.